These ten poems take us to the heart of human experience with all the passion of the Russian spirit. The selection is a first co-publication with Pushkin Press and offers a thrilling snapshot of a vast and unique literary landscape. Boris Dralyuk was born in Odessa but has lived in Los Angeles since he was a child. He has translated Isaac Babel’s Red Cavalry and Odessa Stories and also selected and introduced 1917: Stories and Poems from the Russian Revolution, all for Pushkin Press. 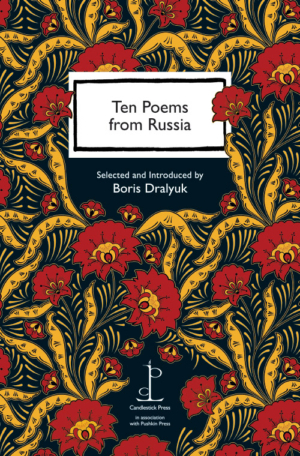 Poems by Anna Akhmatova, Nikolay Gumilyov, Georgy Ivanov, Yuri Kazarnovsky, Mikhail Lermontov, Osip Mandelstam, Julia Nemirovskaya, Boris Pasternak, Alexander Pushkin and Marina Tsvetaeva.